Jordan Development, an oil company, has applied with the Michigan DEQ for a permit to drill for oil and gas at a church, Word of Faith, in a high density residential area of Southfield, Oakland County, Michigan. The method that will be used to extract oil and gas from this well is “Acidizing”. The methane and chemicals not captured in tanks will be “flared” into the air subjecting nearby residents to the toxins. to the well more freely. The Michigan DEQ is accepting public comments to consider when reviewing the application. 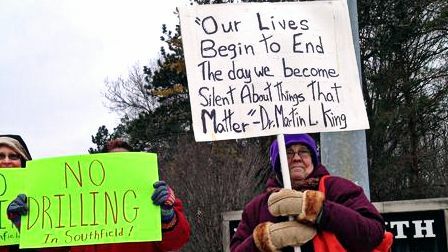 Email comments asking the Michigan DEQ to DENY the Southfield drilling permit. The deadline for public comments is Monday, January 18, 2016. I do NOT support the DEQ issuing the Word of Faith drilling permit in Southfield. 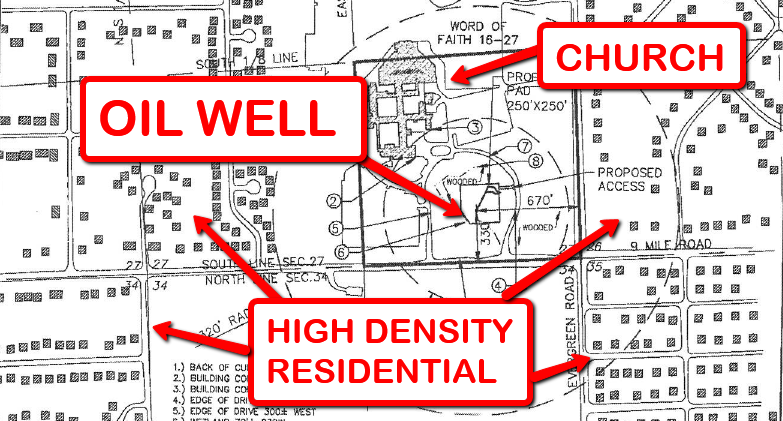 An oil well in mine or any other residential area in Oakland County would be detrimental to our property values. The drilling proposed would entail drilling enhanced with chemicals – “acidizing”. Although not technically “hydraulic fracturing” according to industry definitions, we do NOT want chemicals on, near or under our residential areas. Given the severely diminished reputation of Michigan DEQ to protect our air and water quality, I feel it is highly inappropriate to even consider issuing a drilling permit in a high density residential area. Although Jordan claims well location would be in a “deeply wooded area” – it would be visible from my home/subdivision. I also have concerns of noise, water and air quality. 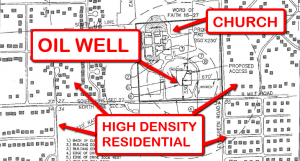 Comments to DEQ should be weighted towards citizens with primary residence near the proposed well site area, and other Oakland County residents, versus non-residents of this vicinity. Simply telling the DEQ you don’t want a natural gas or oil well will not make a difference in their permitting decision. But you may make a difference by sharing information about the local on-the-ground conditions that you know about. You may also make a difference by asking questions about a permit, about how it may be designed to specifically protect you and your community, or a special natural feature or resource, from pollution and potential harm. The drilling proposed would entail drilling enhanced with chemicals ‘acidizing’. We do not want chemicals on, near, or under residential areas. Do not approve this permit.